The Florida Deer Rut is unlike any deer rut across the country. There are a lot of theories and differing opinions on what causes the whitetail deer rut. Hours of daylight decreasing, geographic latitude, genetics, climate, evolution and moon phase are many factors that hunters and deer enthusiasts have debated over the years. To get to the science behind it and learn the facts about what impacts the rut, I asked FWC whitetail deer research biologist Elina Garrison. Some hunters believe deer from other states released in Florida years ago is one of the reasons why the deer rut here is the widest ranging of any state – from July in extreme south Florida to early March in extreme northwest Florida and the Green Swamp Basin. Garrison said climate is a factor but it really only plays a part in northern, colder states, where the timing of the rut occurs so fawns are born in the spring after the late winter storms and when the most food is available. But they must be born early enough to put on suitable weight and fat to survive the following winter. That’s why there’s such a short window for when breeding must occur in northern states. Florida’s relatively mild climate and long growing season allows fawns to be born at various times of the year, Garrison said. Although it is a popular theory among hunters, Garrison says several research projects have proven there is no relationship between the deer rut and the moon phase. Another interesting fact is the average time a doe stays in heat is about 24 hours. “The breeding chronology study we did shows that conception dates within an area vary as much as 9 to 110 days, with an average of 45 days, and most does breed within 60 days, meaning rutting activity can occur over a two-month period,” Garrison said. If a doe is not bred during her first heat, she will come back into estrus again in about 26-28 days, Garrison says. If the doe doesn’t conceive, this cycle can be repeated but normally not more than a few times unless there are not enough bucks to breed all the does. In which case, an area could experience a secondary or even third peak rut. If any of this deer talk is getting you fired up to continue hunting this season, then grab your favorite primitive method of take and follow the deer rut up to the Panhandle and take advantage of Zone D’s late muzzleloader season. 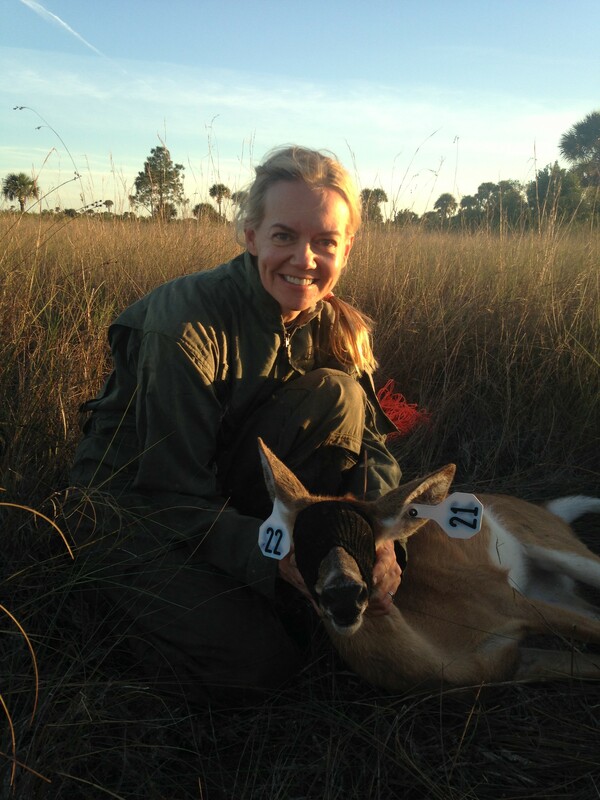 FWC white-tailed deer research biologist Elina Garrison with a doe captured during the South Florida Deer Research Project in Big Cypress National Preserve. Photo by Tony Young. General gun season ends Feb. 17 in zones B and D, but if you’d like to keep hunting deer, Zone D has a late muzzleloading gun season that extends whitetail deer hunting opportunities by a week and runs Feb. 18-24 on private lands. The season was established to give hunters an opportunity to continue hunting northwest Florida’s late whitetail deer rut, which runs mid-January through February. On private land, a $5 muzzleloading gun season permit is required along with a hunting license and $5 deer permit (if hunting deer) to hunt during this season, and hunters have the choice of using a muzzleloader, bow or crossbow. But the only muzzleloaders allowed are those fired by wheel lock, flintlock, percussion cap or centerfire primer (including 209 primers) that cannot be loaded from the breach. For hunting deer, muzzleloading rifles must be at least .40-caliber, and muzzleloading shotguns must be 20-gauge or larger. There are 14 wildlife management areas in Zone D having a late season in February, but it’s referred to as the archery/muzzleloading gun season. Those areas are Apalachicola, Apalachicola River, Beaverdam Creek, Blackwater, Chipola River, Choctawhatchee River, Econfina Creek, Eglin AFB, Escambia River, Escribano Point, Perdido River, Point Washington, Tate’s Hell, and Yellow River. Season dates vary by WMA, so be sure to check the brochure for the area you want to hunt. Hunters may use bows or muzzleloaders, but no crossbows – unless they possess a Persons with Disabilities Crossbow Permit. Besides a hunting license, $26 management area permit and deer permit (if hunting deer), hunters who choose to hunt with a bow must have a $5 archery season permit, and those using a muzzleloader need a $5 muzzleloading gun season permit. All the licenses and permits you’ll need can be obtained at most retail outlets that sell hunting and fishing supplies, Florida tax collector offices, by calling 888-HUNT-FLORIDA or at GoOutdoorsFlorida.com. Deer and wild hogs are most commonly hunted during this season. Only legal bucks may be taken (even if using a bow). South of Interstate 10 in Deer Management Unit D1, one antler must have at least two points. North of I-10 in DMU D2, all bucks must have at least three points on one side or have a main beam of at least 10 inches long to be legal to take. On private land, the daily bag limit is two. Bag limits for deer on WMAs differ, so consult the area brochure before you go. During the late muzzleloader season on private lands and archery/muzzleloading gun season on WMAs, dogs may not be used to hunt deer. However, you may use a leashed dog for tracking purposes. You’re allowed to take deer and hogs over feeding stations on private land, but it is illegal to use such feed on WMAs. And it’s important to know that turkeys are not a legal game during this season. The 2018-2019 fall/winter hunting seasons may be winding down, however, there are still great opportunities to get out there. 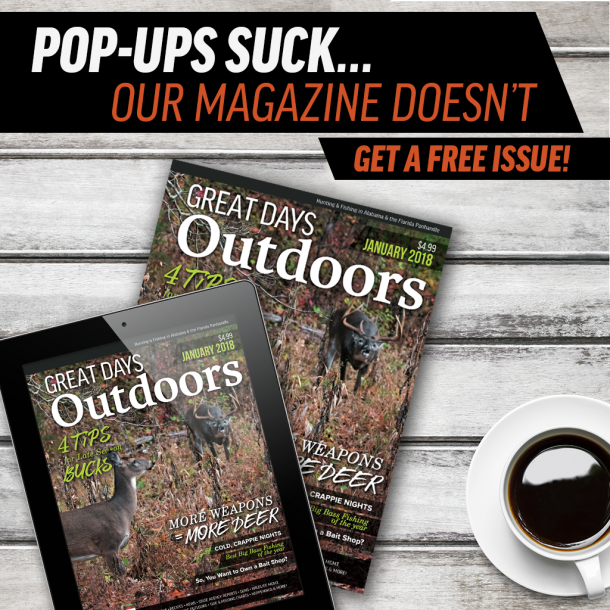 This February, catch the hunting excitement of the late whitetail deer rut that occurs during Zone D’s late muzzleloader season. Native Floridian raised up in the Red Hills of Tallahassee. Hunting spokesman for the Florida Fish and Wildlife Conservation Commission and outdoor writer. Avid deer and turkey hunter, has caught 49 bass over 8 pounds and has been known to wrestle a gator every now and then. 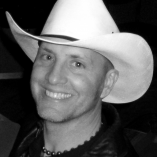 Nashville recording artist who wrote,“Waitin’ on Tom,” the theme song for the National Wild Turkey Federation’s TV show.